I am a sophomore at Rutgers University-Camden, studying psychology with a minor in childhood studies and social work. I am also – with great pride – a first generation college student. I aspire to become a child psychologist. During the spring semester of my freshman year, I had the opportunity to attend the Class Action First Gen Summit with six other classmates. This experience was welcoming, influencing and uplifting. It wasn’t until this summit that I truly looked at myself and acknowledged what I have accomplished. At the summit, I learned that my identity as a first gen student was nothing that should be carried with stigma. Who I am and what I represent is undeniable and worthy of praise. I met many other spirited, intelligent and motivated individuals with exceptional energy. All of the workshops that they hosted seemed so interesting, and I wish I had the opportunity to attend them all. But I am happy for choosing the set of workshops that I did. I attended “How to Stay Centered in Difficult Times” and “Post Graduating Planning: Practical Advice from Fellow First Gen Students.” These workshops centered around strategic planning for both the present collegiate journey and the future. They also provided tips for different ways navigate the experience, especially during hard times. This experience gave me the confidence to face the remainder of my collegiate career with optimism and also wisdom, knowing that while the journey will be fun sometimes, things also will occur that I do not anticipate. I often refer to the information these workshops provided, whenever tackling a situation that is new to me. I will forever be grateful for attending these workshops. The workshop that left the biggest impression on me was “Collaborating with Administration to Create a First Gen Space on Campus.” During this informative, exciting workshop, presenters from the University of Chicago explained how and what they did to create a first gen center through collaborating with the administration on their campus. The workshop gave me many ideas on how to make a similar impact on my campus. Most importantly, it motivated me to run for president of B1GS (Bridging 1st Gen Students), the only 1st Gen student organization on campus. Within this organization, I have created a textbook rental system for first gen students to be able to rent textbooks free of charge. All of the books that we use have been secured by organized donations. This program has already been state-recognized mostly by all remaining Rutgers University campuses, Newark and New Brunswick. With the influence of the Class Action workshop and the fiery passion to help those who share the same identity as me, I have made a small difference on campus by breaking a financial barrier and alleviating financial stress for a good group of first generation students. I owe a lot to the summit, as the organizers opened a door for me with inspiration and ideas waiting on the other side. Without that, I would not have made a change, as I have happily done. student. 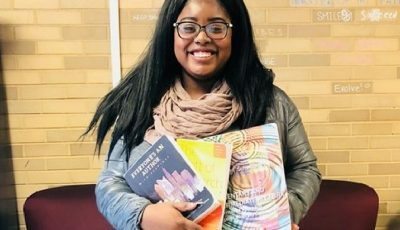 After attending the Class Action First Gen College Student Summit in 2017, she was motivated to run for president of B1GS (Bridging 1st Gen Students) and created a textbook rental system for first gen students so they could rent textbooks free of charge. Johnasia McCrea is a sophomore at Rutgers University-Camden, studying psychology with a minor in childhood studies and social work. She is also – with great pride – a first generation college student. 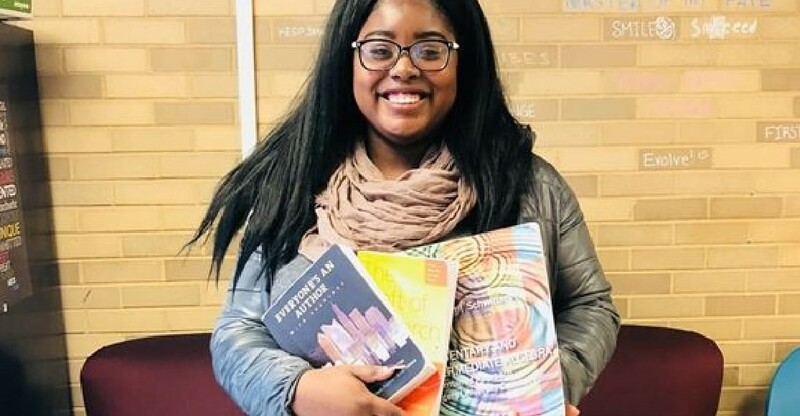 After attending the Class Action First Gen College Student Summit in 2017, she was motivated to run for president of B1GS (Bridging 1st Gen Students) and created a textbook rental system for first gen students so they could rent textbooks free of charge.